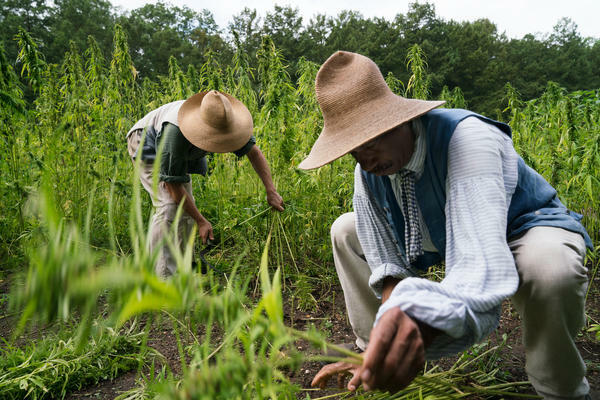 Justin Filipowski (left) and Peter Curtis, dressed in 18th-century post-Colonial costume, harvest hemp at Mount Vernon, George Washington's historic plantation. It is the first hemp crop harvest on this Founding Father's estate in decades, maybe centuries. Hemp historians say the exceptionally strong fibers could be used for making sails, repairing fishing nets and clothing slaves. The Farm Bill is up for renewal this year, and there is a chance that industrial hemp could become a legal crop. 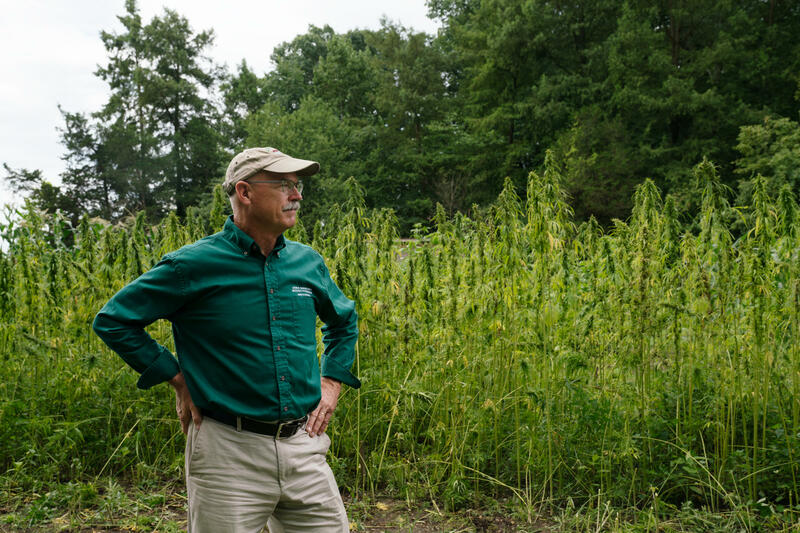 Dean Norton, the director of horticulture at Mount Vernon, stands in front of the plot of hemp grown this year. 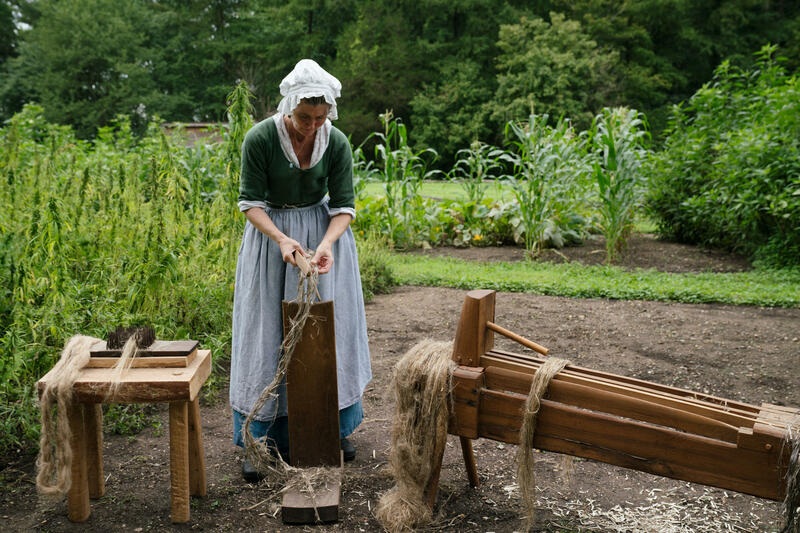 Deborah Colburn, a historic trade interpreter at Mount Vernon, demonstrates the process of turning dried hemp into a pliable fiber for making cloth. Brian Walden hoped by having hemp planted at Washington's historic home, the crop could get a very public image makeover. Mount Vernon is able to grow industrial hemp because of a provision included in the federal Farm Bill passed in 2014. It allows states to harvest the crop in limited supply for research purposes only. This summer, horticulturists at Mount Vernon partnered with the University of Virginia and planted hemp once again. "To bring this crop back it just really helps complete our agricultural story," says Dean Norton, the director of horticulture at the estate. 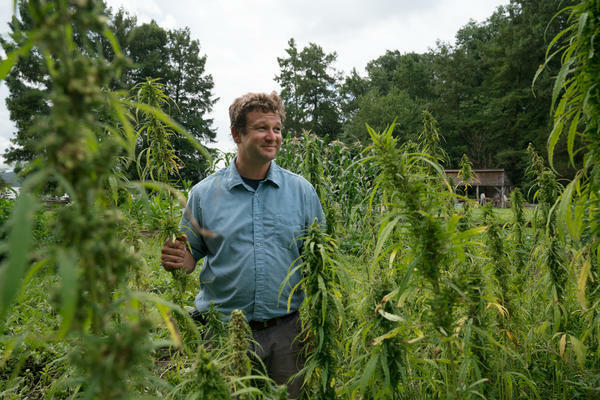 The push to bring back hemp came from a Charlottesville, Va., farmer, Brian Walden, who considers himself a "hemp patriot." He hoped planting the crop at Washington's home again could give hemp a public image makeover. 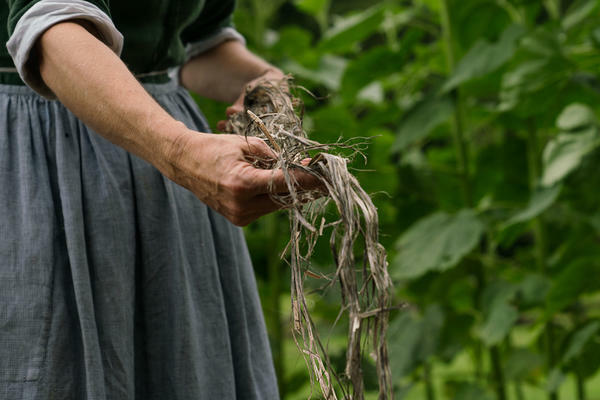 "And [get] the message across that this is an innocuous plant that has real benefits and our Founding Fathers knew that and they planted it," Walden says. But convincing the deciders at Mount Vernon wasn't easy. "It's been two generations that we last grew hemp. That means it's lost from the general population's knowledge or memory," Walden says. It took months for him to make the case. 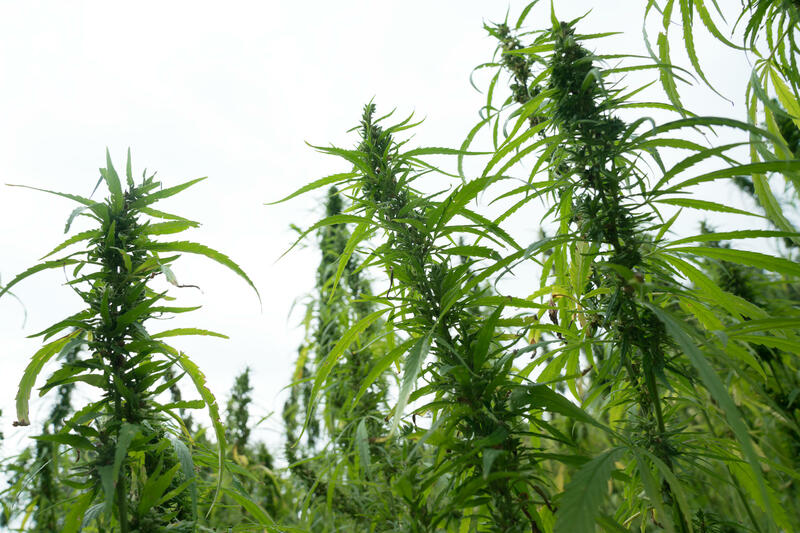 Hemp is still considered a controlled substance by the federal government, but Mount Vernon is able to grow industrial hemp because of a provision included in the federal Farm Bill passed in 2014. It allows states to harvest the crop in limited supply for research purposes only. According to the National Conference of State Legislatures, 38 states considered industrial hemp legislation in 2018. To be clear, the hemp harvested at Mount Vernon is not the type of cannabis you smoke, like its cousin marijuana. Rather, it's used to make rope, cloth and a host of other products. Hemp historians say the plant was not just a widely grown crop in Colonial America, but that farmers were mandated to grow it by the British crown because of its versatility and because the exceptionally strong fibers could be used for making sails, repairing fishing nets and clothing slaves. A crackdown on the plant began in the 1930s, when the federal government took steps to tighten control on cannabis, through a Marihuana Tax Act. In 1970 all cannabis plants were lumped together, regardless of THC levels. And ever since, hemp has been a Schedule I drug, just like heroin, LSD and ecstasy. Hemp and marijuana do have similar aromas, but the level of tetrahydrocannabinol – or THC, the chemical that induces the intoxicating high — is minuscule in hemp. That does not keep Norton, the horticulturist, from lighting up with excitement when talking about the plant. He gets a kick out of the tourists who stop and take pictures next to the 7-foot-tall stalks. "This is totally for interpretive value," Norton says. "We could light a bonfire, sit around and nothing is going to happen to you." The Farm Bill is up for renewal this year, and there is a chance that industrial hemp could become a legal crop. This could be a boon to farmers, like Brian Walden, who predict American hemp production could be a billion-dollar industry. 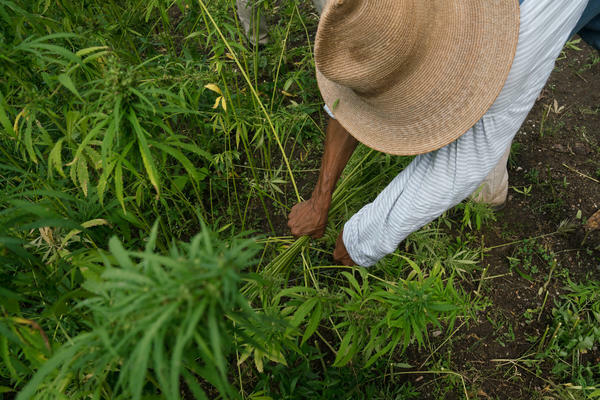 According to a June report by the Congressional Research Service, "the global market for hemp consists of more than 25,000 products in nine submarkets." Hemp fibers can be made into yarns, paper, construction materials, even parts for automobiles. Hemp oil can be used in lotions and cosmetics. Walden says that because industrial hemp is not something a lot of American farmers grow, it is also not a commodity caught in an escalating trade war, like soybeans and beef. "It is something that can boost their farming in a time when tariffs are inhibiting that," says Walden, who is also a member of the Virginia Industrial Hemp Coalition. John Hudak is a senior fellow at the Washington, D.C.-based Brookings Institution and author of Marijuana: A Short History. He says there is a real opportunity to legalize industrial hemp because politicians are changing attitudes toward the plant. "I think where we're at right now, is a situation in which, finally a lot of members of Congress ... have finally stopped buying drug war-era rhetoric, stopped thinking about the cannabis plant in a very uniform way," Hudak says. That includes Senate Majority Leader Mitch McConnell, R-Ky., who has been pushing for industrial hemp's legalization since April. "I don't think it's a slam dunk, but I do think there's a real opportunity for passage," says Hudak.